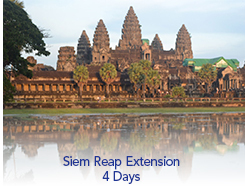 Siem Reap has become Cambodia’s swinging boomtown and an exciting gateway into the exotic, dreamlike world of Angkor Wat. Designated the eighth wonder of the world, the ancient ruins of the vast Khmer empire have fascinated and mystified adventurers for centuries. Or Any Area That Has An Airport!